blog.HalloweenAdventure.com | Latest News from the Costumes Trend FrontLines! : ELVIS, ELVIS! Elvis, Elvis, let me be! This Halloween, try rockin’ and rollin’ with the King with our Elvis costumes! We recommend practicing your dance moves in the mirror and exercising your singing voice in the shower. Our official Elvis Black Leather Suit Adult Costume is a natural showstopper that includes leather pants and leather jacket. White t-shirt isn’t included, but we’d recommend you get one, and a microphone really tops it off. Now all you’ve got to do is slick back your hair and work on those moves. The great thing about the King? Well, there are many great things, but one of them was his ability to switch it up. Just like Elvis himself, we’ve got multiple outfits to help you rock in style. Our Elvis Gold Lame Suit Adult Costume is another fabulous option. This baby is solid gold and includes pants, jacket, shirt and gold bowtie. Looking to imitate a very specific look? 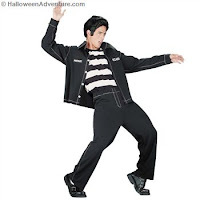 Try our Elvis Presley Jailhouse Rock Adult Costume. Costume includes pants and high collar jacket with white stitching, Black & White striped shirt. Jacket features the King's last name and jail house number as seen in the film. 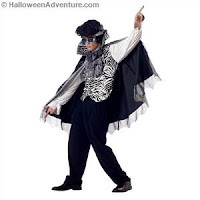 Go a totally different route than normal with our Vegas Vampire Elvis Adult Costume. This baby is made for the strip, with its loud prints and excessive cape. Costume includes shirt with attached vest, cape, jabot. Whichever costume you do choose, remember that the only reason Elvis was king was cause he had the ‘tude and the moves to go with his fame! Stretching, dancing and singing are recommended as practice to get in shape for this fabulous costume!